Quickly produce designs, engineering and pricing. Design commercial, industrial, residential and agricultural buildings. Design a variety of styles: Gable, Gambrel, Single Slope, American Barn, and Lean-To. Comply with IBC Codes, snow loads up to 100 lbs., wind loads up to 200 mph. Include and calculate the engineering fee for the building and foundation design within the building price. Have access to our engineers who are licensed for all states, including Alaska and Hawaii. Access training videos for you and your staff. Use as many copies of the program as you need for your sales people. Use the program in “Sales Mode” as a sales tool, design and price a project as the customer describes it to you. Receive Pre-Designed product brochures personalized with your logo and company information. Provide construction plans, contracts, construction manuals and construction videos to customers. We would love for you to join us as a CSC Dealer. 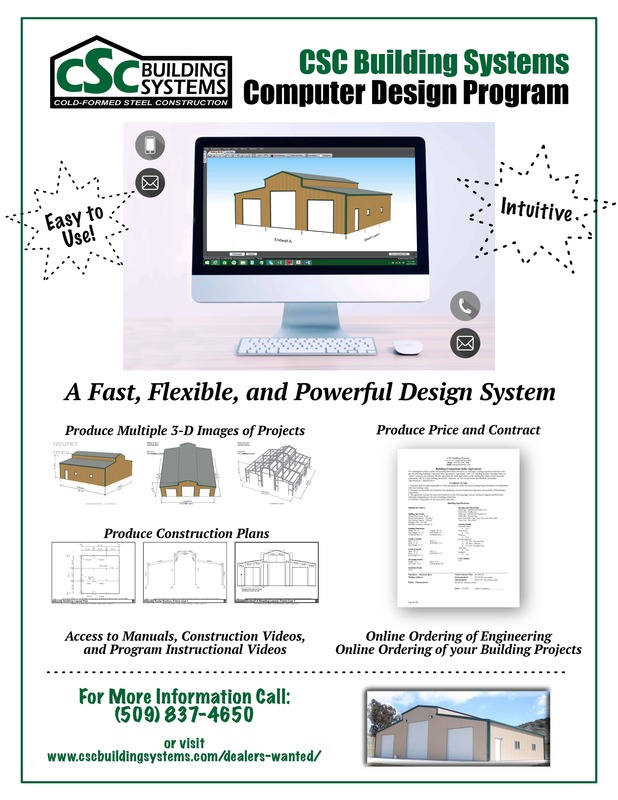 At no upfront cost, start designing and selling CSC Buildings today!